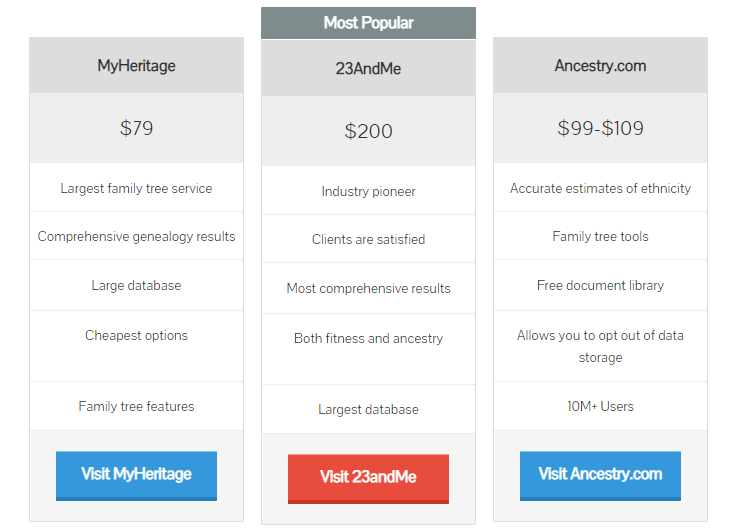 AncestryDNA Vs. MyHeritage – Both of these companies started with software to build and maintain family trees. In the late 2010s, both companies expanded into the DNA direct-to-consumer testing market. Ancestry and MyHeritage now both offer DNA test kits in addition to their family tree subscription services which provide research and documentation of your family history. Both companies focus mainly on recent genealogy, and neither provides mtDNA, Y-DNA, or health-related genetic testing services. Check out the executive summary of this Ancestry vs. MyHeritage comparison here, or read the whole thing below! (we made a similar comparison for 23andMe vs Ancestry here). Conclusion: These two companies are strikingly similar, and were born out of North American and European markets. They test and analyze much of the same genetic information, and provide the user with similar results. Ancestry seems to provide more thorough and complete results, with a better user interface. This gives Ancestry a step up over MyHeritage. Special Features Compare ancestry origins between family matches. Use family tree features and research database as part of subscription package. Build a family tree with thousands of individuals, using the company’s software and DNA results. Subscription service adds a number of discovery features. Ancestry and MyHeritage have very similar roots. However, their markets have generally been separated. Ancestry has a complicated company history of providing genealogy research resources, dating back to their first magazines and floppy discs on the subject. Based out of Utah, the company has a very large base of users in the United States and North America in general. MyHeritage started in 2003 by a software programmer, Gilad Japhet. The company provided software for creating family trees, much like Ancestry. However, MyHeritage is based out of Israel and the majority of their customers are European. In 2012, Ancestry offered its first genetic testing kit. MyHeritage followed suit in 2016. Both companies now service a wide variety of regions and languages. However, since a majority of their customers were from pre-established markets, their genetic databases largely reflect this. AncestryDNA claims over 10 million users, while MyHeritage claims to hold enough data to create a family tree of 13 million people. Both companies have an even larger database of family tree information, available through a subscription service. Winner: Draw! As each company gains a more world-wide distribution, the differences in their customer base will be reduced. Ancestry has been around slightly longer, but MyHeritage boasts powerful software and an incredible user-base. AncestryDNA offers a look into your relatively recent ancestral past. For reasons they explain on their support site, Ancestry only looks at autosomal DNA. This gives a good look at your more recent ancestors. The tests compare your DNA with that of around 43 reference populations from around the world. With this data and data from their tens of millions of family tree users, the company can estimate your relatedness to various global populations. An interesting feature of the service is the ability to track and learn more about potential migrations your family may have been a part of. Ancestry shows these potential migrations and provides some background on why these migrations took place. The platform also has a family matching service, which can predict how closely related you are to other users of their platform. This service allows willing participants to contact each other to further explore their family heritage. The Ancestry DNA kit is typically $99, and the company has various subscription services available for building and exploring your family tree. MyHeritage also offers a DNA test kit for exploring your genetic ancestry. Like Ancestry, their kit analyzes your relatedness to 42 different global populations. Their platform also provides interactive maps for exploring your family’s history. One feature even estimates how many of their users from each region are related to you, showing on a global map where these living relatives are located. The service also allows you to match to known relatives and contact them if you both consent. Unlike Ancestry, the service does not seem to analyze possible mass migrations your family was a part of. Winner: Ancestry takes a small advantage in this category, simply for analyzing and supporting research about how your family may have migrated. Both companies boast a large database of users, resources, and tools for analyzing who you are related to. Unfortunately, both companies focus on autosomal DNA and miss the deep ancestry provided by mtDNA and Y-DNA. When it comes to the results you receive, both companies provide an online platform detailing the results of your test. Both companies have interactive maps, allowing you to explore various regions. Ancestry has a slight advantage here as well because their maps are supposedly easier to use and understand. Further, Ancestry provides information about how your family may be connected to mass migrations. This information, tied into their vast research library, could provide real and complete evidence about your family history. Winner: Ancestry, by a nose. MyHeritage and Ancestry offer incredibly similar tests. Both tests are comparing to around 40 reference populations, though they likely have differences based on how many individuals are in each reference population and which individuals were tested. Users do claim that AncestryDNA’s results are more understandable and provide more comprehensive information. Winner: Draw! Both companies will use your data to improve their services and research genealogy. MyHeritage phrases it in worse terms, but Ancestry basically has equal privileges over your data. The good news is both companies allow you to delete your data upon request. Both companies have had their fair share of media coverage, both good and bad. MyHeritage suffered some bad publicity in 2017 when the company was hacked. Nearly all 100 million users had to change their passwords, but it seems no private data was exposed. Ancestry has taken heat for providing seemingly inaccurate results to some users, but in general has mostly positive coverage. In terms of reviews, Ancestry fairs slightly worse than MyHeritage. On Amazon, Ancestry has over 4000 reviews with 4 of 5 stars. MyHeritage has less than 1000 reviews on Amazon, with an average of 3.6 stars. However, Trustpilot gives MyHeritage 4 of 5 stars with over 2,500 reviews. Users who reviewed Ancestry on Trustpilot give the service only 2 stars with over 4,304. This number seems skewed, however, as 73% of people give the service 5 stars. Anyone looking to use one of these services is interested mostly in their genealogy and family history. Though Ancestry does offer a side package that discusses traits, both companies mainly focus on your relatively recent historical past. Both companies also offer access to a wide variety of non-DNA resources and family tree software to build and explore your history. Both companies also provide a means for finding and contacting genetic relatives. The between the companies comes in two forms. First, Ancestry provides contextual information around your family history. This can be events, migrations, or even famous historical figures that you may be related to. This information can be extremely helpful in crafting a family tree. Second, Ancestry provides slightly more interactive and understandable results. Winner: Ancestry! Though both companies have a number of similarities, Ancestry pulls ahead slightly with more interactive results and details about potential migration routes your family may have used. However, MyHeritage is still a good choice and may have more information and records relating to European-based genealogy. Which DNA Kits is the Best? How Does Home Genetic Testing Work? The Truth about Genetics and Disease: Is it Nature, or Nurture? 1) Information on this website should not be considered as medical advice. We are NOT medical professionals. 2) If you suffer from a serious health condition that you want to learn more about using DNA test kits we strongly recommend you won't. There are other, more advanced, solutions for that. Consult your physician. 4) Some of the links on this website are referral (affiliate) links. This is how we make money and keep the site free of advertising.